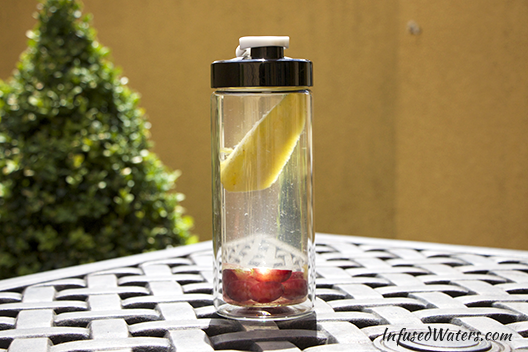 Meet your new favorite infused water for summer! I make this recipe 24 hours in advance and take the water with me on hot days. The taste is sweet (but not overly sweet) and the water is incredibly refreshing, especially when you drink it cold. Also, this infused water recipe has “wow” factor and is a great beverage to serve at parties and picnics. Infuse in the refrigerator for 4 to 24 hours. Longer infusion times will result in a more potent flavor. Serve cold. Because grapes are not as flavorful as the pineapple, you can use as many as you would like, but 6 works well for this size of container. Be sure to use organic grapes and to cut them in half so that their juices can escape. Bonus: the grapes are still tasty after being infused and you can eat them after you are have finished drinking your water. This recipe is easy to scale up. The key is to not use too much pineapple because it will dominate the flavor of the grapes. A good rule of thumb is to use 6-8 grapes for every wedge of pineapple. I hope everyone is having a great summer and that this infused water makes it that much sweeter! Do you ever mash up the fruit or squeeze your citrus to get more intense flavor? I’ve often used lime, grapefruit, lemon and even tangerines in my water but I usually squeeze the fruits into the water. In my country it’s easy to find pineapples yet difficult to get organic grapes. At least I don’t know for sure whether the grapes I bought are organic or not. So what should I do with the grapes after washing them to make this recipe? Is it fine to let the skin on or should I peel it first? Hi Amy, look’s awesome. I’ll try that for sure! Hi…. im newbie for infused water. My question is, should it be put in the refrigerator? I cant drink cold water. Will it have no effect to our body when it is made in the room temperature? The only reason why I recommend putting your infused waters in the fridge is because, unlike store-bought juices with preservatives, the fruits will decompose and have the potential to make you sick. That is the worst case scenario and only happens if you leave your waters out for days. If you like room temp water, you are actually in luck because fruits will infuse much more quickly at room temperature. A good rule of thumb is to infuse for 2-3 hours at room temp, then drink up. 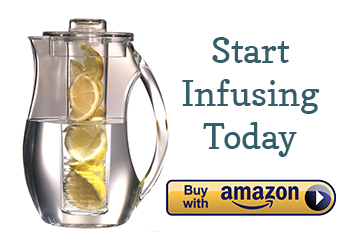 If you can’t drink all of the water in one day, put your infused water in the refrigerator overnight and let it come back to temp before drinking. I love this you have helped me a lot. Can you tell me how many calories are in a fruit infused drink, for example Strawberry/Basil or Pineapple mixed with other fruits? You say organic grapes, can regular grapes be used?